The Affordable Companies has proudly revealed their re-branding as ACo – Love Where You Live! In the heart of every home is a space where friends and family gather to cook, talk, entertain and spread love – that space is the kitchen. 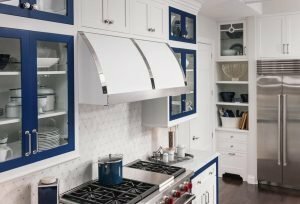 It’s a joyful time of year, so we wanted to spread the love of a product available at ACo, Medallion Cabinetry by Elkay, a family owned business since 1920. Medallion features three distinctive lines of cabinetry for unique features and function. Starting with Platinum, available in knotty alder, cherry, maple and quartersawn oak, all with extensive finish modification options! Inset and quiet close are standard features within Medallion to consider when selecting a level for your project. Need a budget-worthy decision? The Silverline shown below is simply stunning with a Carriage Black Classic finish. Would you believe this selection is a half-overlay and soft close?! Ready to meet in the middle? Consider the gold product line where value meets style. The customization of islands, hoods and hardware is expansive and a site to see! 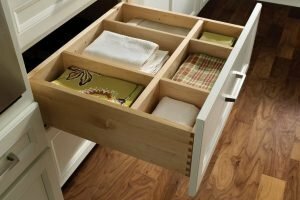 I know we have some wonderful organizers in the Indianapolis area or even clients who thrive on the perfect place to put their plates, pans or KitchenAid mixer! As a southern at heart, I love a good cloth napkin and how about this perfect towel/napkin divider?! Is this cabinetry line not stunning?! We can’t wait to bring our next client into the ACo showroom to customize their kitchen design. 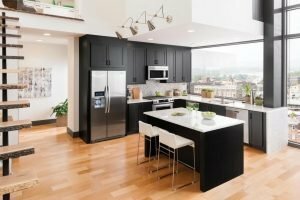 If you are planning a kitchen remodel, remember to visit the ACo website at https://liveaco.com or give them a call to schedule your appointment at 317.575.9540.